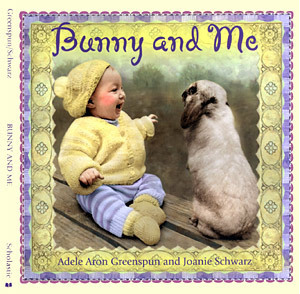 This book, Bunny and Me, is especially meaningful because it evolved into a mother/​ daughter /​ granddaughter project. The models for the baby are my two granddaughters, Ariel and Frances. Originally, I photographed Ariel and the bunny in Rittenhouse Square with black and white film. 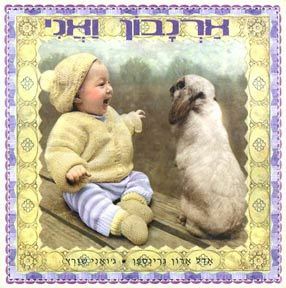 The lop-eared bunny belonged the children's librarian at the City Institute Library in Philadelphia. When I needed to enhance the plot, I photographed Frances, Ariel's younger sister, as soon as she grew into the hand knitted outfit. The baby picture chasing the bunny is Frances. There mother, my daughter Erica, knitted the overalls and sweater and hat for Ariel before she was born. The children's publishing industry requested the images in color. My daughter Joanie, who is an illustrater transfomed the images to color using a computer program called photoshop. It is very exciting to have my daughters and grandduaghters included in the process of making Bunny and Me.